You probably didn’t need reasons, but I’m giving you them anyway, as the wise philosopher Billie Piper once sang, because I want to, because I want to. Indulge my shipping heart a moment and allow me to reflect on what made the White House romance quite so special. 1. They were a beautiful accident. In fact, because Rob Lowe is reeeeal pricey, folks, Whitford was originally asked to play Sam (perish the thought! ), and he had to fight for Josh. He won the part in the end, of course, but back then, no will they/ won’t they tension was intended between Josh and Donna; rather, Josh was supposed to romantically spar with White House media consultant/professional disappearing act, Mandy Hampton. Donna herself, Janel Moloney, had originally auditioned to play CJ and lost out to the wonderful Allison Janney before being offered a few lines in the pilot episode as everyone’s favourite deputy deputy chief of staff. Chemistry happened, and those few lines earned her an extra scene in the pilot episode. She continued earning herself extra scenes throughout the inaugural season until Moloney was promoted to a series regular for Season 2. By this time, all hope had been lost for a Josh/Mandy romance, praise be. Moloney explained: “I decided early on that this was a passionate, deep love relationship where my character was mad, head over heels in love. Because that’s drama, that’s fun. A little bit of love’s not fun for anybody. I think it made the relationship special because there wasn’t really anything like that on the show. And you can’t get rid of a hot, burning romance on your hit show.” True dat. 2. The best things come to those who wait. Josh and Donna take their sweet time to get together, eventually locking lips in a moment of euphoria, mid-Season 7. 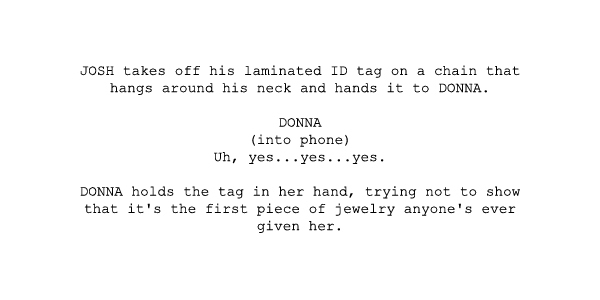 Yes, I’m sad that we had so little time to bask in the post-consummated glory of a Josh and Donna relationship. But the beauty of the slow burn is that all of the little moments feel like big ones. Any time they flirt or gaze at each other or basically outright declare undying love (“If you were in an accident, I wouldn’t stop for red lights”), it’s a huge effin’ deal. The best thing is, these delightful occurrences come on the regular. A particularly sweet, very downplayed moment occurs when Josh is telling Donna’s prospective boyfriend, Jack Reese, some dorky stories about her. She’s mortified; he’s confused. He insists, “Those are good stories about you, though. Those stories would make me like you.” It still burns me that she doesn’t notice the intense googly eyes he’s making at her as he says it. Yes, I took every single piece of bait they threw at me for seven seasons. Expect no less. I WAITED FOR THEM FOR SEVEN YEARS. 3. Individually, they are two of the most dynamic, complex, heartbreaking and amusing characters in their show – or in any show, period. It’s perhaps unsurprising that separately Donna and Josh (in that order) make up the top two on my list of West Wing faves, but it would be a poor show to overlook their respective brilliance. Donna is witty, confident, brave, compassionate, determined, and incredibly good at all the jobs we see her have. As Josh’s assistant, she begins under-qualified and ends up over-competent. Donna embarks on an arc of empowerment through the later seasons of the show, a storyline that sees her all the way to the office of FLOTUS chief of staff. Whether she is pursuing her ambitions, bringing the comic relief or providing a moral compass, Donna Moss is a constant joy. It’s really no wonder that Josh couldn’t bear the idea of losing her, professionally or personally. Speaking of Josh, he’s plenty interesting himself. Desperately loyal, committed, intelligent, funny and just a little broken, Sorkin expertly juxtaposes his amusing arrogance with such deep vulnerability that one can’t help but fall hard. One minute he’s declaring, “I drink from the keg of glory, Donna. Bring me the finest muffins and bagels in all the land.” and another he’s flying all the way to Germany at a moment’s notice to be at Donna’s side. I would argue that Josh is the most complex character (while Toby’s the most nuanced) and by mid-Season 2, the show has inadvertently made him its very compelling lead. Whitford’s Emmy for Noel, an episode that explored Josh’s post-traumatic stress disorder, was about as well deserved as Emmys get. 4. Bradley Whitford and Janel Moloney. The actors who play them are candid about their characters’ onscreen relationship, openly expressing support for it. Moloney said of their collaboration: “I really feel like that’s my central relationship on the show. Any scene I do with Brad is particularly enjoyable.” Whitford obviously shared this sentiment, having told the director, “God, I love her!” immediately after their first scene together. On their characters, both conceded that the pair belong together. Whitford admitted that “they’re absolutely crazy about each other” despite their jobs, adding that, “I think I know deep down that emotionally, as a human being, I can’t function without her and I think professionally, as a human being, I can’t function without her, either.” Geez. Now I’m struggling to function. At a reunion, the duo was asked what they imagine their fictional counterparts are doing with themselves several years on. Married with a kid, they agreed. HE BROKE THE LAW TO PROTECT HER. HE MAKES THE LAW. HE IS THE LAW. HE BROKE THE LAW… FOR HER. Don’t tell me to be calm about this! I will not be calm. 6. They bring the funny. Their witty repartee never ceases to entertain me. Always a delightful dose of sharp dialogue and sizzling chemistry, biting sarcasm permeates their every exchange. At times, most times really, they resemble an old married couple – reluctantly sharing food, dressing each other, having their petty squabbles and sharing the most over-familiar rapport. They play tricks on each other (the “XW-9 warhead in a silo 93 feet below the Eisenhower putting green”) and they play tricks on their colleagues (“I framed Roger Rabbit!”). They fight (“You know, there are times when, to put it quite simply, I hate your breathing guts.”) and they flirt (“You are a very powerful and a very handsome man”). It’s hard to know which is more enjoyable to watch. Both actors have a knack for understated physical comedy and superb comic timing, which lends itself beautifully to the lightness of their scenes. They get each other. When Josh’s symptoms of post-traumatic stress disorder begin to manifest, Donna is the one to notice and get him help. When Donna is caught in a roadside explosion, Josh drops everything and flies to Germany to be with her. In a more low-key display of the bond between them, after Donna hears of the suicide of Donovan Morrissey in The Benign Prerogative, she tells Josh that she “needs to learn how to […] keep things at arm’s length”. He replies simply: “I hope not.” The sincerity of the line’s delivery shows his affection for that part of her, her deep-rooted compassion as a driving force of her character. It’s hard to talk about Josh and Donna “getting” each other without referring to her conversation with Amy in Commencement. “You have to get Josh,” Donna states, the implication being that Amy does not. “His sister died in a fire while she was babysitting him. She tried to put it out; he ran outside. He went off campaigning; his father died. He wakes up in the hospital and discovers the president’s been shot. He goes through every day worried that somebody he likes is gonna die and it’s gonna be his fault. What do you think makes him walk so fast?” She gets him, like really gets him. She’s thinking about all the factors that have shaped who he is and how he behaves on a moment-by-moment basis. She takes the time to wholly know him and so when an outsider comes to her for some insight on the mind of Josh, it’s as simple as: “You have to get Josh.” But she’s the only one who does. 8. They don’t even try to hide it. 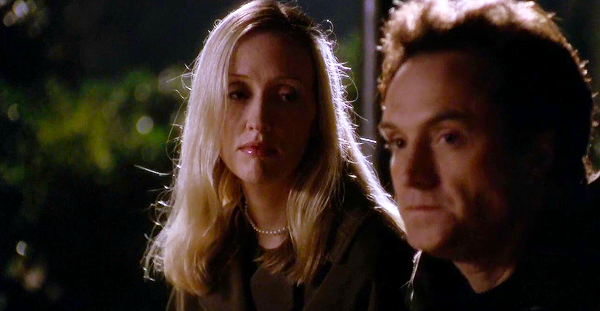 Did anyone else kind of want it to become a Mary Marsh-involved scandal that tested their relationship but ultimately brought them closer together? My best friend and I talk about this so often that it’s become real to me. I feel like Taylor Swift wrote ‘I Know Places’ about this very dream. 9. Their first meeting and THAT stage direction. The obstacle in their relationship is legitimate. It’s not that they won’t admit to themselves that they’re in love; it’s not that they are with other people; it’s not that they are cop partners who can’t risk complicating their working relationship. If they were to enter into a relationship, they would risk tarnishing the Bartlet presidency with a pretty big scandal that the administration could very much do without. Obviously they know the term is going to be four or eight years, and potentially that’s what is in the back of their minds whenever they confront their feelings. The backlash to any potential romance would be catastrophic if it were to happen while Donna was still his assistant. It would seem as though he was taking advantage, or that she was sleeping her way to the top. Romances from Sorkin’s other shows have had comparatively insubstantial obstacles – Dana and Casey’s nonsense, Matt and Harriet’s nonsense, Will and Mackenzie’s nonsense. I’m just saying, he’s good at romantical nonsense. Dana and Casey’s felt like a real low point until you caught Season 2 of The Newsroom and were introduced to the second round of Mackenzie and Will. Seriously, their obstacle was mindless stubbornness and literally nothing else. If there had been a Josh and Mandy romance, I have a feeling it would have resembled the aforementioned list of nonsense. The fact that Josh and Donna were a blessed surprise to even their writer may have actually worked hugely in their favour. Throughout the show, their situation, their problems, their struggle is real – making it all the sweeter when you reach the delightful final chapter. I love all of these reasons so much. They’re truly the best. Someone tell me not to rewatch all of this show right now. Love every single one of them. I am due a rewatch soon.